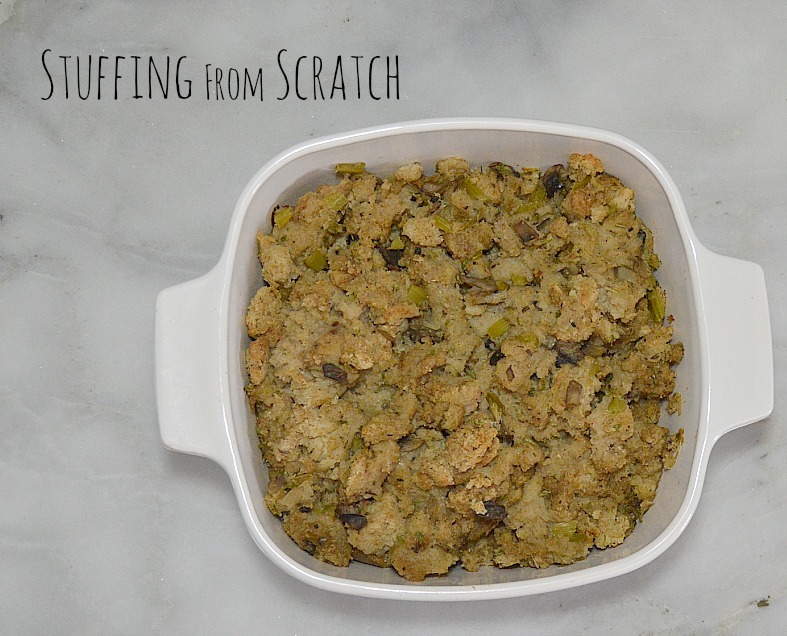 This stuffing recipe is ALL from scratch! Yes YOU can! I served it and didn’t tell anyone where it came from and I was told it was very delicious. No one guessed that it was also vegetarian. I made this recently for my family. One of our newest family members who recently married my cousin is an amazing cook, she is also a vegetarian. So the pressure was on and I had my work cut out for me. How do you make a vegetarian stuffing that will also please the meat eaters? I love the flavor of rye bread and mushrooms have a meaty flavor so naturally used both. I also boiled up some vegetable broth and didn’t place the stuffing in the turkey. The broth and bread can be made ahead of time so you don’t have to run around like crazy all day. That’s the trick of cooking from scratch, having batches of staples on hand. Prepare vegetable broth and bread have ready and set aside. In a large skillet melt butter and add shallots and let caramelize. Add mushrooms, celery, rosemary, thyme and half of salt and pepper. Cook until mushrooms are browned adding more butter if necessary. Add broth to skillet and remaining salt and pepper. Simmer and taste, add more salt and pepper or spices if necessary. In a large casserole dish, place sliced bread cubes. Pour mixture over top in small amounts and mix well. In small amount continue to add enough of the broth mixture until the bread is covered but not too over saturated. You want it wet enough to not get too dry in the oven, it should appear soggy. Place in oven at 350 degrees for about 20-25 minutes or until slightly browned. Remove from oven and let cool. Making the vegetable broth and bread ahead of time makes this recipe easy. You can also use chicken broth or place stuffing in turkey while turkey is cooking if you prefer. For the vegetable stock I boiled three onions, three cut up carrots, five celery stalks with the leaves. I added a teaspoon of salt and a half teaspoon of pepper and about 1/4 cup chopped thyme and 3 rosemary sprigs in a medium pot with about 6 cups of water. I boiled this for about 1 1/2 hrs. I tasted it and when it had enough flavor I removed it from heat and let it cool to use it in the stuffing mixture. The day before I made a round loaf of rye bread. While the broth was cooking I sliced the bread into 1-inch cubes andset-asidee. If you have never made bread before, store bought works well. 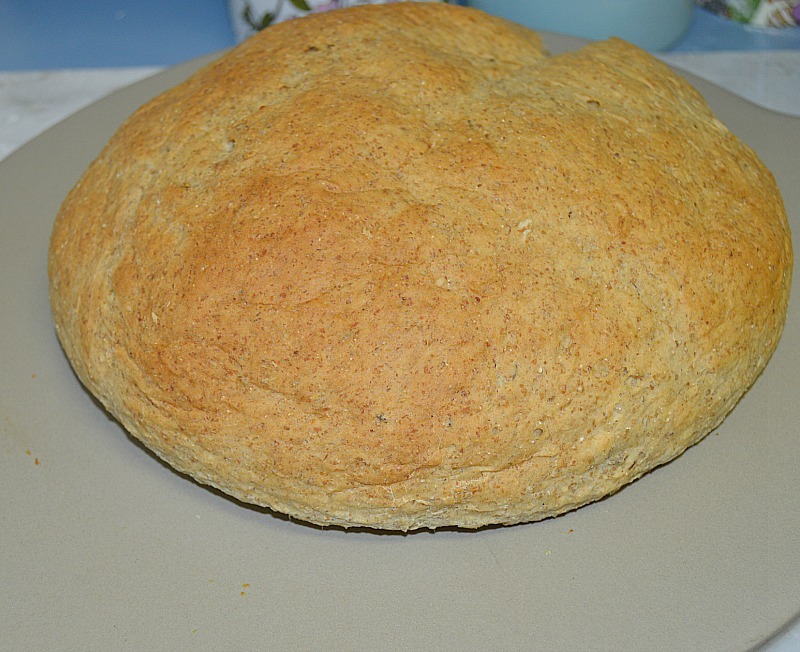 I only used rye with this recipe, you can substitute for any kind of bread. The rye bread I used is about the equivalent of a small loaf of bread.